to paint anything. Whether one actually wants to though is an entirely different issue! I'd left school art lessons vowing never to paint another still life and managed to keep to that intention for sixteen years. Then came the Chardin exhibition at the Royal Academy of Arts in London. Mind-blowing! I came straight back to my studio and started "Study in Russet & Gold" in oils. 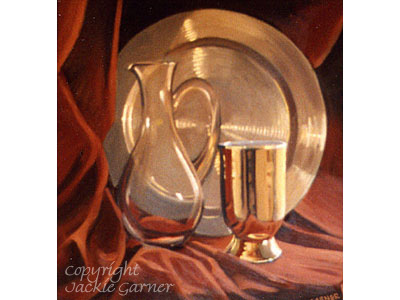 "The Amber Bottle" and "Champagne Celebration" followed, also in oils as the richness of the paint made it the ideal medium. 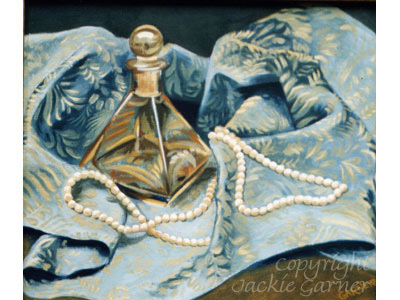 The great advantage of still life for artists is that they can choose exactly what to explore: varying textures, subject, spatial relationships… The lessons transfer to any other creative endeavour: after all, composition is common to any painting, and painting the sheen on silk isn't so different from painting the shine on a bird's wing. Another advantage is that, unlike a bird, it does stay still! These days I don't have much time for painting still life as I always seem to be working towards a wildlife exhibition, but there's a half-finished still life in my studio, so maybe one day soon….